Ok so when you rotate the motor and watch the cam spin is there any point that the valve rocker is tight ? Like lo play ? Is that spot where the rockers are tight anywhere near top dead center ? I just find it so odd that there is a spot like that and it’s not top dead center. Lol we were just talking about jumping! You don’t learn do you? Lol nice work kid keep at it. If you can’t break it then it’s no fun! 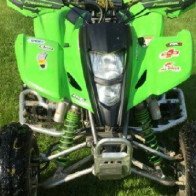 ....haha a lot with a honda or 2x4 polaris or yamaha.... the bayou just has a frame too long and too heavy for the power it puts down..no torque.. I do not mind the longer frame for wheelies myself. weight no..
Nooooo thanks! I’m kinda backed up on bikes right now. Three bikes to sell right now. And after watching @06kfx440 ride his bike I have to get that Mojave I have sitting around doing nothing moving. I have not rode a clutch bike in a while so im Itching. You can ride mine any time you want Frank. Had a guy come and drop his bayou off for me to service. While he was here he asked about my bayou. Went to start it and it floods out like it did before (last issue I posted about it before the broken shock) pissed me off pretty bad cause yesterday and the day before it started no problem.....now the guy is probably like what the hecks wrong with this kid- his bike wont even run....though he was a lot nicer than that about it... so all in all I want to resolve this issue now before I get his bike working so that he could test ride mine when he picks his up... This is either a sp issue or a ignition coil issue I'm thinking... Its the 3rd brand new sp the bike has blown since I rebuilt... What do yall think? Your float in the bowl may be getting a little jammed up allowing excess fuel to get into the engin/head thus flooding out the sp. The float has a pivot point where it mounts to the carburetor. Either it’s getting stuck on the way up or the pin that the float pushes up is getting stuck. I know the over flow would show signs of fuel dumping out but it may not be so severe that it’s showing. Also one more thing. The top of that pin has a rubber tip on it. Take a look and maybe replace the pin if needed. Check that the pivot point on the float looks straight and nothing is restricting its travel. Btw, bayou is for officially for sale for $800 first come first serve lol if you read this thread, you know all of it's history as far as I've owned it... massage me privately if interested. I will see if I can check the voltage at the boot. How is the best way to do that? Just hook positive of a multimeter to the boot and the other end on the frame?